In the blood of our body has sugar or glucose and it is natural. This sugar or glucose supplies the energy to the cells of our body. It also gives the energy to other organs of the human body. How does our blood get this sugar or glucose? Some blood sugar is produced by our liver and some are by our muscles. The quantity of blood sugar that the liver and muscles give to the blood is not enough to supply the amount of energy our body’s cells and organs needed. Vast or maximum amount of blood sugar comes from the food and drinks having carbohydrates we take in our daily life. Basically, the food containing too much carbohydrate produces a huge amount of sugar in our blood. How does our body control this sugar or glucose? Our body contains insulin, a kind of hormone, which is produced by the pancreas, a gland located behind our stomach. This insulin controls the sugar or glucose level in our blood. It manages the cell of our body to take up glucose and store it. The problem is seen when this insulin does not work properly or the pancreas gland unable to produce the amount of hormone that our body needed. At this point, blood sugar builds up. 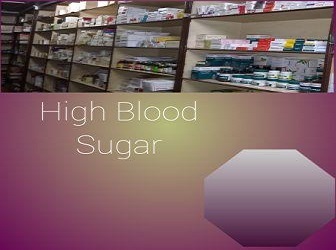 High blood sugar is one of the greatest problems of our sub-continent. It causes many health hazards. These health problems are the symptoms of high blood sugar. 1. Pains or a headache regularly. 2. Feels very hungry or thirsty. 3. Feels very tired without doing too much work. 5. Vision problems or blurred vision. 6. Often needs to urinate. 7. Wounds do not heal shortly instead it needs too much time. 2. Breathing problems such as the short breath. 3. Sometimes smell on the breath. 4. Quick or very fast heartbeat. Though the above mention list is not a complete one, the person having such problems must consult a doctor immediately. If it is unattended, the person’s life may be in danger. If you are feeling these symptoms, you should consult a doctor as soon as possible. High blood sugar has a number of symptoms. Here I am describing a few among them. 1. Urination and thirst is the most problem. A person having high blood sugar has to go urinal frequently. This urination affects the kidneys of our body. Frequent urination also causes increased thirst. 2. Sudden weight loss is another cause for suffering from high blood sugar. This occurs due to the insufficient supply of glucose in the blood of our body. To get the energy to work the human organs properly, the body burns muscle and fat of our body and causes weight loss. 3. After suffering from high blood sugar for many years, a patient may have to go under Diabetic Neuropathy, a kind of complication for which the patient may have to face numbness and tingling in the hands, legs and even in the feet. A patient suffering from high blood sugar may have to face a heart attack or stroke which may sometime cause death. In some cases, the patient’s kidney may fail to act properly. It is also found that the patient’s kidneys are totally damaged and there is nothing to do without transplanting a kidney. What are the different types of High Blood Sugar or Diabetes? Basically, there are three types of Diabetes are found among the patients suffering from Diabetes. These are Type 1, Type 2 and Gestational. Type 1 Diabetes is the most dangerous one among the others. It gradually destroys our immune system and as a result of it, the many types of diseases attack the patients. This type of diabetes mainly occurs in children and young adult. It may also occur at any age but it is rare. Type 2 Diabetes mainly occurs at the age of 45 or above with a family history of diabetes that means if your ancestor or any family members have such kind of diabetes. However, it may also occur at any age but it is very rare. This type of diabetes is not as dangerous as Type 1 and it can be controlled by taking medicines and changing food habits. Physical inactivity and high blood pressure may develop such kind of Diabetes. Gestational Diabetes has mainly occurred among the women when they are pregnant. In most cases, it is found that this kind of diabetes or blood sugar goes away after the delivery or baby is born. But there is a chance of developing Type 2 diabetes in later life by the woman who suffers gestational diabetes in her pregnancy period. This kind of diabetes can be controlled if the patient is under the treatment. A patient who is suffering from high blood sugar or diabetes must check his or her blood sugar level regularly. There are many devices available in the market that may help you to check your blood sugar level easily. The booklet inside the device package will guide you how to use it. But always keep in mind that a doctor advice is highly needed and you should keep in regular contact with him or her. A person having Type 1 diabetes will need to take insulin according to the doctor’s advice. The patient may have to take insulin several times a day. The doctor will tell you everything and will guide you in controlling sugar level in your blood. Always keep in touch with your doctor. The patient mostly women during the pregnancy period with gestational diabetes will have to change her food habits as per her doctor’s advice. Sometimes oral medications or insulin may also be needed to control the sugar level in her blood. The doctor or physician will guide you in this case. To avoid heart diseases always check cholesterol and blood pressure at regular intervals. The risk of developing Type 2 and Gestational Diabetes can be prevented by taking a balanced diet, regular exercise and keeping a healthy weight. But in the case of Type 1 Diabetes, there is no way to prevent it. Thanks for sharing the preventions of high blood sugar.